Meals are a large part of your daily life, and exquisite food helps create memorable experiences. 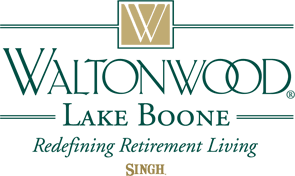 At Waltonwood Lake Boone, our premier dining services offer a unique combination of healthy eating and fine foods, all prepared by our skilled culinary staff. We are dedicated to ensuring unforgettable dining experiences that meet your dining and nutritional needs, without the hassle of meal preparation. Dining at Waltonwood is a sophisticated experience, complete with a warm and inviting ambiance that’s perfectly suited for indulging in your favorite foods. Our Lake Boone chef and culinary team attend to residents’ individual needs by developing a dietary program that encourages good nutrition, with the creative freedom to accommodate food choices that meet everyone's preferences. For the past fifteen years, two overarching principles have driven Chef Bryan Minton’s passion and career. Creating community through food and using the freshest possible ingredients to create unique dishes, has guided this Johnson & Wales grad to where he is today. 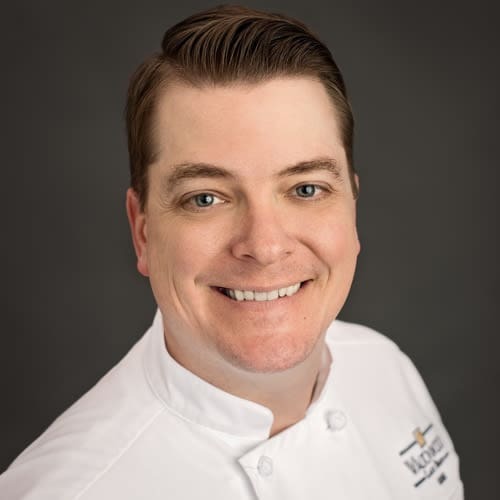 Bryan started his journey as the Chef at the Figure 8 Island Yacht Club, where he cultivated a a love of obtaining fresh, local ingredients to incorporate into his daily specials. His next steps took him overseas to Iraq, where he found himself feeding the US troops. He quickly learned how food created a sense of community and provided a reprieve from the rigors of working in the harsh desert environment. During this time, Bryan also honed his talent for learning other cultures’ food traditions and incorporating them into traditional American dishes. The challenge of providing a sense of home in every meal drove Bryan through the ranks during his two years overseas. When he returned Stateside, Bryan found a home with Sodexo, where he served as District Chef in Kentucky. And it was in Kentucky that Bryan gained a true appreciation for harnessing locally sourced, fresh ingredients as often as possible. His menus for the students and faculty of Centre College were built around the Kentucky Proud program. He partnered with local butchers and farmers to ensure ingredients were homegrown and always fresh. As a native North Carolinian, he understands the power of the food produced in the Tarheel state. Chef Bryan resides in Raleigh with his wife Townsley and two children; Jacob (4) and Campbell (2). Chef Bryan looks forward to using the freshest ingredients from all over the state when possible. Residents can look forward to tasting his elevated Southern cuisine, hopefully sparking a fond memory or evoking sheer delight.